ALLENTOWN, Pa., March 20, 2019 /PRNewswire/ -- Peregrine falcons are once again making their presence known around PPL's 23-story headquarters in downtown Allentown, giving rise to hope they'll once again nest near the top of the iconic building. The raptors this year find themselves with a new nesting box and the public will be able to see more of them thanks to streaming video from three new cameras installed inside and outside the box. PPL worked with WFMZ-TV to install the cameras and will also be working with Hawk Mountain Sanctuary as a science partner to attach telemetry tracking units to the falcon fledglings at the time the young birds are banded by the Pennsylvania Game Commission. A live video feed of the nesting box area can be viewed at pplelectric.com/falconcam. "This is what environment and community are all about," said Mike Hasel, PPL Electric Utilities manager of environmental compliance. "PPL has a long-standing involvement with efforts to restore the peregrine falcon population in Pennsylvania that dates to 1995 and the Pennsylvania Peregrine Project. We're excited the birds have returned and hope they successfully nest again this year. We're proud of the viewing and learning opportunities we're able to provide to the public." According to the Pennsylvania Game Commission, an adult peregrine can reach a speed of more than 200 miles per hour in a vertical dive and averages about 60 miles per hour in level flight. Peregrine falcons feed on other birds, usually by striking them in flight. Their prey includes pigeons, blue jays, and other mid-sized song birds. In the wild, falcons nest on high cliffs. In urban settings, tall buildings make a suitable alternative. 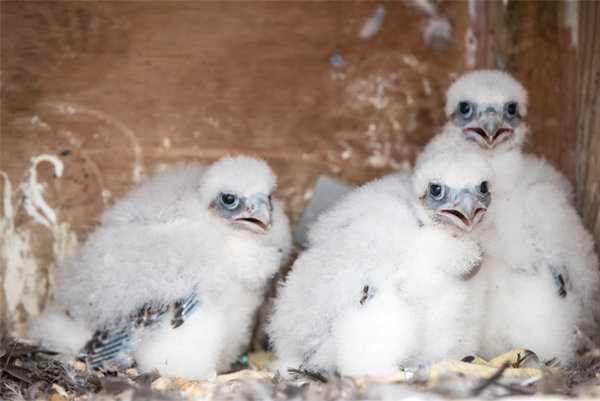 Three peregrines hatched last spring at the PPL nesting box outside the 21st floor of the 23-story PPL building and one of them — a female — was spotted this past fall at a wildlife refuge in Virginia. According to the game commission, the peregrine falcon is endangered and protected under the Game and Wildlife Code. It formerly was listed as endangered, then threatened at the federal level, but was removed from the federal Endangered Species List nearly 20 years ago. In addition to peregrines, PPL also supports efforts to help ospreys and bald eagles. The company assisted in putting up osprey nesting platforms at various locations in its service territory in the past several years.